In a previous post, I have described the tone of Eric Clapton in the early days of his career. After participating in some of the most famous british records of the 60s using the big fat tone of Gibson guitars, Clapton stunned fans when he switched to a Fender sunburst Stratocaster. It was for the Layla recordings in 1970. I will show in a video at the end of this post how you can approach EC’s tone and especially how to emulate the booster integrated into his Fender signature model but first, let’s talk about his post-1970 guitars, amps and effects. Shortly after switching to Fenders, Eric Clapton assembled his own Stratocaster, named “Blackie”, using pieces from different guitars. Blackie is probably one of the most famous Stratocasters ever. During the 70s and early 80s, Clapton made use of the “in between” pickup positions of his Strat to get really “glassy” and sparkly tones. In 1985, Fender approached Clapton to discuss the possible release of a signature model. After a few different tests, the result was a Strat with a V neck, 3 Gold lace sensor pickups (same as on the “Strat plus” of the time) and a booster circuit built into the guitar. This booster circuit, that Clapton calls a “compressor” although it isn’t, offers a whopping 25 dB of boost. It is basically like having a boost pedal integrated into the guitar and allows Clapton to get his Strat to sound as if it had Humbuckers, increasing the fatness and the sustain. The Clapton Stratocaster is still being made today. The pickups are now Fender Noiseless pickups but the V neck and the active mid-boost circuit have remained (find more detailed info on wikipedia). This booster circuit is a unique feature in the Fender line and chances are your Stratocaster hasn’t got it. This is a personal opinion but I find that since Clapton added this mid-boost circuit into his guitars, he let go of his sparkly 70s sound for a fatter tone, full of sustain. I was also quite amazed to see that on the 2005 Cream reunion DVD, he seemed to be using the middle pickup a lot. During the 80s, Clapton went through a phase where he used Soldano amps and a number of rack effects such as the very rare CS5 Tri Stereo Chorus that I seem to hear a lot on the “Eric Clapton with Friends” concert. This was a bit of of a particular period tone-wise as Clapton never had much gear. Some fans regret that in the 90s, he went back to a much simpler rig. Nowadays, he mostly uses his signature Fender Stratocaster and a Fender Custom Shop Tweed Twin Amplifier (1957 Tweed Reissue). Add a Vox wah pedal in the mix and you have it! Simple, yet effective. I must also mention that he has a Leslie rotating speaker on stage and a switch to go from his Fender amps to the leslie and back. See here for more detailed info. This means his overdrive comes from the 57 Tweed Twin reissue amp cranked probably to the max and being further pushed by the mid-boost circuit of his guitar. By manipulating the guitar controls, he can go from clean (by lowering the volume and the booster) to screaming (by cranking the volume and the booster) without touching his amp. A lot more versatile than you’d think! And let’s not forget Eric Clapton’s style and phrasing which is an integral part of his tone. He greatly varies his pick attack while playing which allows him to modulate the amount of overdrive with his fingers. Tyring to sound like him is a good way of realising why 50 years later, Clapton is still god. The best way to emulate Clapton’s tone would be to use his signature Stratocaster and plug it into a cranked old Fender tweed twin which is not something very practical if you play in your bedroom or in small practice room/venues. 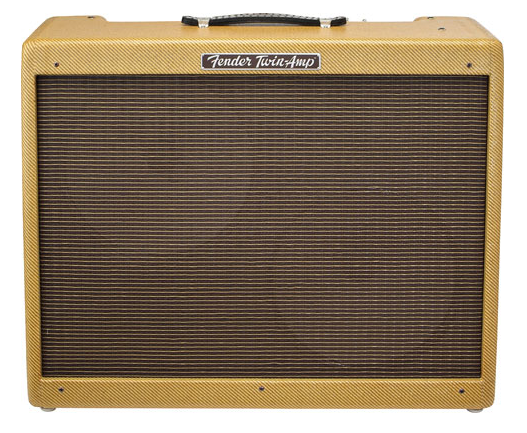 And let’s not forget the 1957 Tweed Twin reissue has a retail price of USD 3999. The guitar used for this video is my American Classics Custom Shop Stratocaster fitted with Kinman Avn Blues noiseless pickup. The amp is my trusty 1974 Fender Champ set clean whose 8 inch speakers cannot really provide much low end but still gives this sparky Fender tone. The settings for the pedals can be seen in the video. I received a comment about my previous video which featured reverb added after the recording in Cubase in order to mimic the 60s plate reverb tone heard in numerous records. The reason I usually add reverb is to make up for the fact that I close mike my amp and don’t get any of the ambiance of the room. It is normal practice in studio environments, however I have decided not to add any reverb on this video above to leave the tone of the gear unaltered. I will be writing a post in the future to elaborate. As to the now famed Tri Stereo Chorus, it keeps on living as a model in some Line 6 gear such as the Space Chorus pedal. Next in my Guitarists series: the tone of a legend, Eric Clapton. I should say “tones” really, as EC had two distinct periods when it came to guitars and gear: the Gibson years in the beginning of his career and the Stratocaster years from the early 70s until now. This first part will be all about the Gibson years and I will show you how to approach the tone of Eric Clapton using common pedals at bedroom volume. Mind you, I am talking about trying to approach his tone. Getting a Clapton type of tone at a reasonable volume is quite difficult since he is fond of non master volume amps cranked as loud as possible, and of course a lot of it is in his fingers and his mastery of the instrument. But first things first, let’s talk about his guitars and amps. The album that really brought attention on Eric Clapton is “John Mayall and the Bluesbreakers with Eric Clapton“, also known as “the beano album” due to the cover showing Clapton reading this popular comics. This album was released in 1966. Clapton’s tone at the time was almost revolutionary as he used a Gibson Les Paul, which wasn’t popular, plugged into a completely cranked Marshall JTM45 (reissue models available from Marshall). The result was a fat tone which has now become an absolute classic. You have to realize that at that time, Marshall was unknown and the JTM45, nicknamed later “Bluesbreaker” because of its impact with the band, was the first Marshall amp ever. And it was heavily inspired by Fender amps! Anyway the classic Gibson/Marshall combo was born and Eric Clapton did a lot to popularize it. There are stories about sound engineers asking Clapton to lower the volume of the amp, which he refused to do as with non master volume amps such as the JTM 45, the gain and the volume are determined by the same knob. As the sixties went on, Marshall amplification listened to the players asking for more power and the result was the 100W Marshall stack. The PA systems at the time were pretty weak and mostly used for vocals or other acoustic instruments which means that guitarists had to rely on their amps to be heard – even in big venues. This explains why some bands carried several 100W Marshall stacks on stage, which would have been properly deafening at close range. In this video, I wasn’t struck by EC’s hairdo or his mustache but by the reverb you can hear in his tone. Was it a studio plate reverb? Or just the sound of the venue? I have tried to reproduce a similar sound using a small clean Fender Champ amp, a Tube Screamer (Analogman TS9) and a Morley Pro Wah. To mimic the reverb heard in the video above, I have added a “Vintage Plate Reverb” in Cubase after the recording. I have used the Reverence plugin with the “Vintage Plate Reverb 2s” preset. The amp was set clean (Volume at 2.5) and the Analogman TS9 had the following settings: Drive at 3, Tone at 9 o’clock and level slightly above 12 o’clock. The wah was plugged before the Tube Screamer and the amp was close miked using a RODE NT4. So guys and girls, it is time to take that twin humbucker guitar out of its closet and crank it! In the next installment of this mini-series of posts dedicated to Eric Clapton, I will focus on his Strat tone.